I remember one of my first Yoga classes – I had raced to the studio from work. Frantic and running late, the whole drive I was creating to-do lists in my head and when I finally made it to the studio and sat on my mat, the teacher instructed us to sit and practice stillness and quiet. I remember closing my eyes, hearing my heart pound loudly and feeling antsy, like there was no way to be still. I wasn’t cut out for this! My mind was way too active. Now I teach Yoga in offices. Folks are having to multi-task and keep track of a million things as their Outlook reminders pop-up every 5 minutes. I’m guessing most of them even have a reminder to come to class. Their minds are full, exhausted and running amuck when they make it to class. What’s the antidote for this racing mind? Is it stillness? For this, let’s turn to the Yogic concept of the gunas. The subtle energies of nature that are present in everything…and the idea that at all times, we are experiencing some sort of combination of the three: tamas (heaviness/inertia/dullness), rajas (activity/turbulence/imbalance) and sattva (light/balance/harmony). Most office yogis show up in a state of excess rajas. Mind racing. If I were to start class by asking them to lie still on a bolster, it would be too extreme a shift of energy. Stillness, meditation, pranayama are all wonderful practices for achieving balance and experiencing sattva, but to get there, sequencing is vital. First, appease the energy present. This means, start with movement. And if people have been sitting all day, start them moving in a different plane instead of more seated work. My favorite (if there’s space for it) is to start standing with feet a little wider than hip distance and turning quickly right and left from the hips (and the opposite foot will pivot as you turn) with the arms dangling and swaying as you twist. You can add to this by making gentle fists that will “tap” your ribs and back as you twist. If there’s not much room, a simple “shaking” practice will also work. Shaking the hands, arms, legs like you’re trying to get water off of them. Then, slowly work toward balancing the energy in excess. Allow the progression of the sequence to go from quicker movement to slower vinyasas with the breath (cat/cow, standing balance flows, half sun salutations, bridge vinyasas). Eventually move to holding poses for a couple breaths. The overall pace will begin to slow. This attention to sequencing will gently lead the yogi to be able to experience rest without heaviness (tamas) and to practice stillness without the racing mind (rajas). In Savasana, offer guidance to keep the mind focused. A simple body scan or breath focus on a part of the body. End with pranayama or stillness in silence. This idea applies to teaching in offices, yes, but the truth is…many people are coming to studios either before or after work as well. They may be trying to fit their practice in to a very hectic schedule. They may be answering emails from their phones right up until they roll out their mat. Appease the energy in excess. Work toward its opposite. End in balance. Next week we will feature a quick focusing practice to balance out the rajasic state of mind. Tune in! 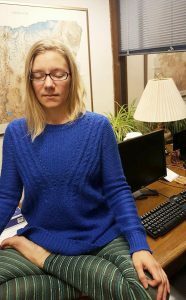 This post is the second installment in the 4-part series about teaching yoga in office settings. Don’t miss the rest of the series! That was my first time seeing you terms. What language is it from? Thanks for a great reminder about how to put our studies to work – at work! Great suggestion – I often start my classes in tadasana, but I like adding the gentle movement as well. Thanks! Always a great resource for me! Oh man! Everything I learn makes me want to know more! It’s like my old teacher used to say…the more we learn the less we know 🙂 There are always more levels! Really enjoying this “office” series. Thank you so much. Your words above definitely ring true for my experiences. Previous story Who benefits from yoga at the workplace?